We received a few notes about yesterday's post. People were concerned that there may be those who are considering Aliyah but the video might cause them to fear. This is probably true. We were not thinking along those lines and it is certainly not our intent to cause anyone to be afraid. War in one form or another is a constant in the lives of the Israelis. Because of this, we saw this video as an encouragement in the midst of our battles. There are those who would like to destroy us, but G-d is ever present and ever on guard to prevent the worst. As we shared before, we know that there are 'giants' in the Land. We do not ignore them but ask for G-d to give us His eyesight to view them as they are. It is a life of dichotomy we live here. There neighbors who would do us harm. And yet, those from the same groups build our cities, drive our taxis and trucks. The man who does our hair, Somi, is from Ramallah. Our gardener, from behind the wall. 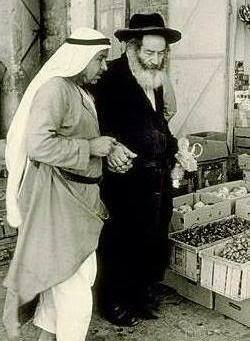 Mohammed runs a little shop where we go at times and have great conversations about 'the old days'. The men work in our grocery stores, the women work at the museums and the zoo and emergency room. We shop together, go to the hospital and cultural events together. At those times we wonder, where is the 'enemy'. Often we see people, like us, who want to have a job, take care of their family and make a good life. It is a delicate balance. It can be a rather odd way to live at times. But it is the way things are here. We believe that which holds the balance is the Hand of G-d. We have been given the opportunity to be a Light to the Nations. It is our task to be such as much as it is possible.